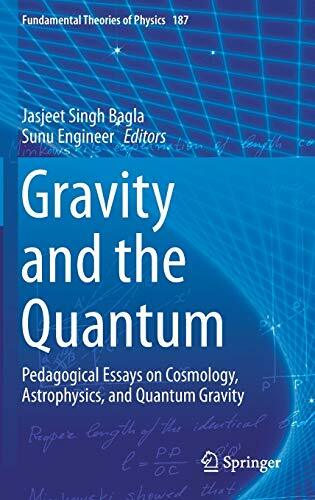 [PDF] Gravity and the Quantum: Pedagogical Essays on Cosmology, Astrophysics, and Quantum Gravity (Fundamental Theories of Physics) | Free eBooks Download - EBOOKEE! Description: This book provides a compilation of in-depth articles and reviews on key topics within gravitation, cosmology and related issues. It is a celebratory volume dedicated to Prof. Thanu Padmanabhan ("Paddy"), the renowned relativist and cosmologist from IUCAA, India, on the occasion of his 60th birthday. The authors, many of them leaders of their fields, are all colleagues, collaborators and former students of Paddy, who have worked with him over a research career spanning more than four decades. Paddy is a scientist of diverse interests, who attaches great importance to teaching. With this in mind, the aim of this compilation is to provide an accessible pedagogic introduction to, and overview of, various important topics in cosmology, gravitation and astrophysics. As such it will be an invaluable resource for scientists, graduate students and also advanced undergraduates seeking to broaden their horizons. No comments for "[PDF] Gravity and the Quantum: Pedagogical Essays on Cosmology, Astrophysics, and Quantum Gravity (Fundamental Theories of Physics)".